Maybe it’s my age…or perhaps it’s the fact that I have less in common than I once did with 300-pound human projectiles launching themselves at one another for the sport of it…but I’m content, these days, to fix my attention on the real challenge of Super Bowl Sunday: a winning menu that can compete with the action onscreen. 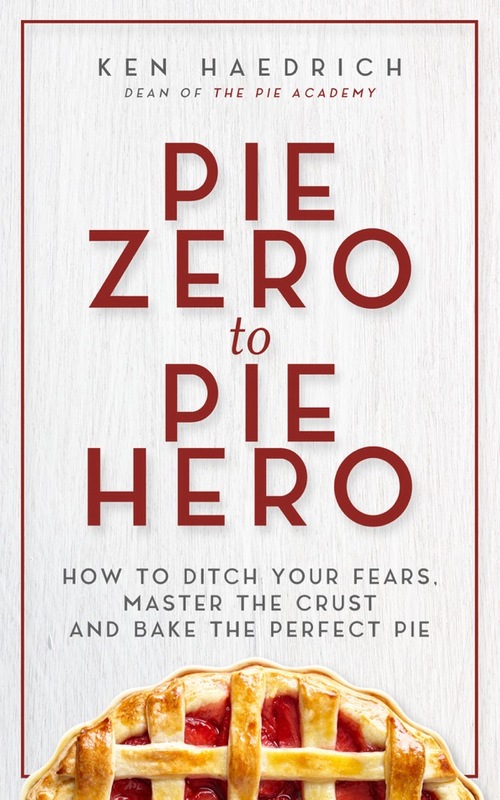 That’s the task I found myself facing this week, arriving at one delectable highlight, fellow pie lover, that’s right up your alley – Taco Pot Pie. Talk about match ups! This hearty dish brings together three elements that understand about teamwork: a crunchy cornmeal crust in place of the taco shell. A spicy, chili-like filling. And a cream cheese-ranch-and-Cheddar topping to smother it all in a soft cheesy blanket. Good, you ask? 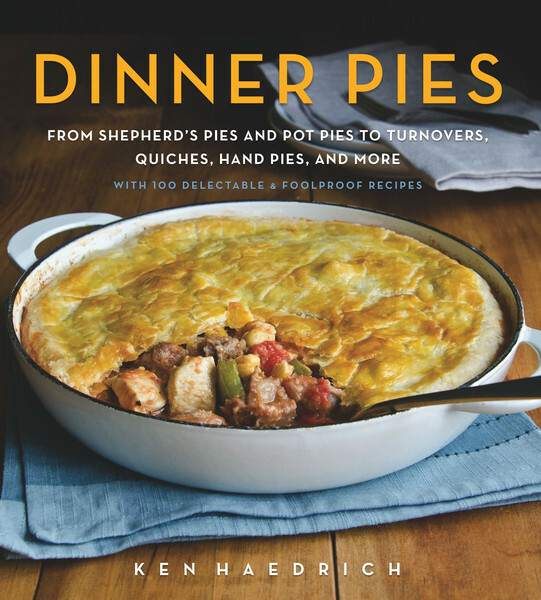 A shoe-in for the Pot Pie Hall of Fame! So let’s begin with the pastry, our Cornmeal Pie Dough, a recipe I’ve written around the food processor since it’s such an excellent tool for the job. (Directions by hand are also included.) Feel free to use another pastry, but I think you’ll appreciate how the cornmeal both tenderizes the dough and adds a slight but noticeable bit of crunch. 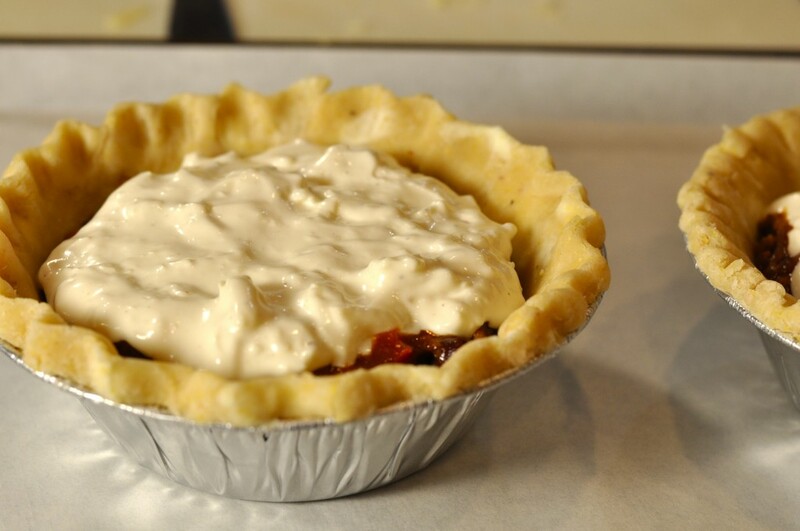 As I recommend for nearly all pie dough recipes, it should be made ahead and refrigerated – as detailed – before rolling. This recipe will serve four as a main dish, or up to eight if you make muffin-size appetizers as you see below. For the main dish servings, use individual 5” to 5 1/2” pie pans with a 1- to 1 1/4 cup capacity. If you’re taking these on the road, consider using disposable aluminum pans. Guys will like the authentic, TV dinner touch. These are 5 1/2” wide and 1 1/2” deep; the manufacturer calls them “pot pie pans” and they make for a generous serving. After you line the pans with the pastry, you’ll shape the edge and either flute it by hand or use a fork to make a simple crimped edge. Then refrigerate or freeze the shells until needed. It’s not necessary to cover or bag them if you’ll be using them within a few hours. 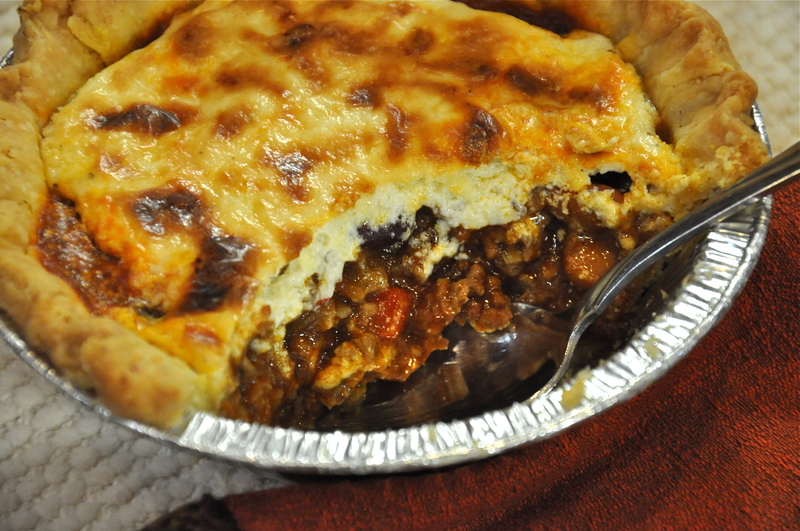 Banish the thought of cutting a corner and simply using plain grated cheese on top. Plain grated cheese is no sin, but compared to our special topping – a sort of hot ranch dip number – there’s little of the excitement, like watching James Taylor at halftime instead of The Rolling Stones. You get it. I bake my pot pies on a heavy aluminum baking sheet. First I adjust my oven rack so it is in the second-to-lowest position. Then I put my baking sheet on the shelf, turn on the oven, and let the sheet preheat along with the oven. The hot sheet helps to brown the crust quickly and thoroughly. And it catches any spills if the pies bubble over. Line the sheet with parchment – if you like – when you put the pot pies in the oven. I’ll typically move the pot pies up to the center rack position about two-thirds of the way into the baking, to help brown the topping. You CAN roll each one separately into an approximate 6-inch circle, if you prefer. But getting the rolled out dough into the cups is tricky: it tends to pleat, double over on itself, and then it’s a challenge to make something attractive out of the edge. Try pressing one and rolling one and see which approach works better for you. Either way, you’ll find it handy to first line the cups with a thin (1/2″ to 3/4″ wide) strip of wax paper, about 7″ long, so you have tabs to help lift the pot pies out of the cups after they’re baked. Otherwise, it can be tricky extricating them. Now have at it, and enjoy the game. As you’ll recall from my previous email, we celebrated National Pie Day this past week on January 23rd. So I thought it would be fitting to pack up some homemade slices, head out into our community, and let some of our neighbors know how much we appreciate them – with a piece of pie, of course. 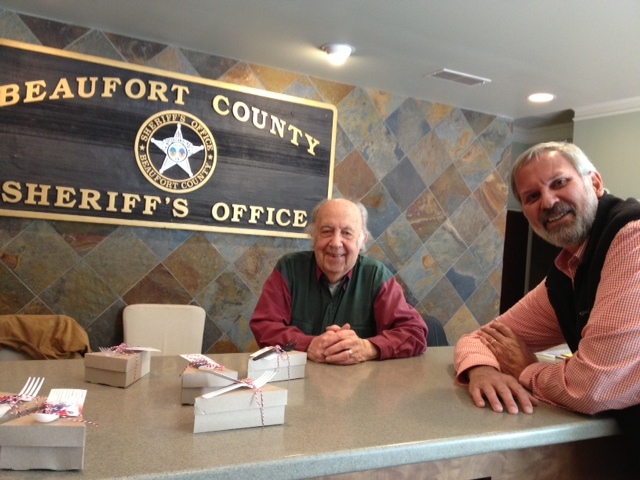 First stop was the Beaufort County Sheriff’s Office, where my wife Bev and I unloaded a tray of apple crumb pie slices for some of the officers on duty. Apparently, regulations prohibit active duty officers from having their photos taken by sketchy food bloggers who wander in off the streets – even those bearing gifts of pie – but the gentleman at the reception desk was more than happy to give us a friendly smile. Next stop, the fire department. 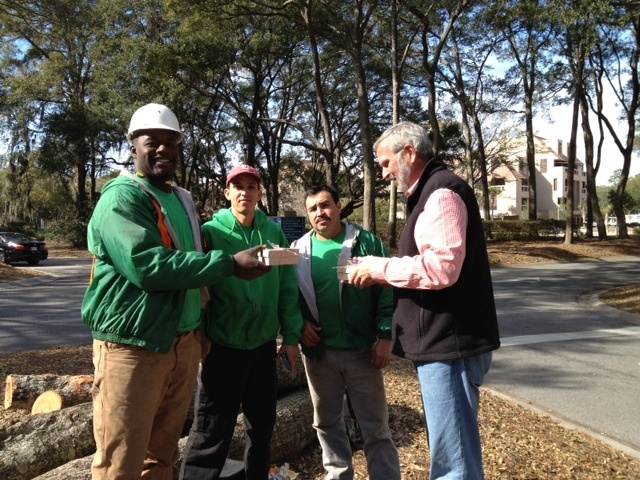 On our way, we passed this pod of tree trimmers working nearby – Damian, Gonzalo, and David. It was hard to tell if they were more exited about the pie, or relieved that we weren’t from Corporate and doing an unannounced audit of their work habits. They all said it was the first time they could remember when someone had jumped out of a passing vehicle and offered them a slice of apple pie wrapped in a gift box. Imagine that. The fellows at the local firehouse over in Palmetto Dunes on Hilton Head were less bound by regulations than our new friends at the sheriff’s department. Not only did Peter and CJ allow us take their photo. They wondered if we had any extra pieces in the car and suggested that a good time to drop off any future pies would be every third day, during their particular shift. 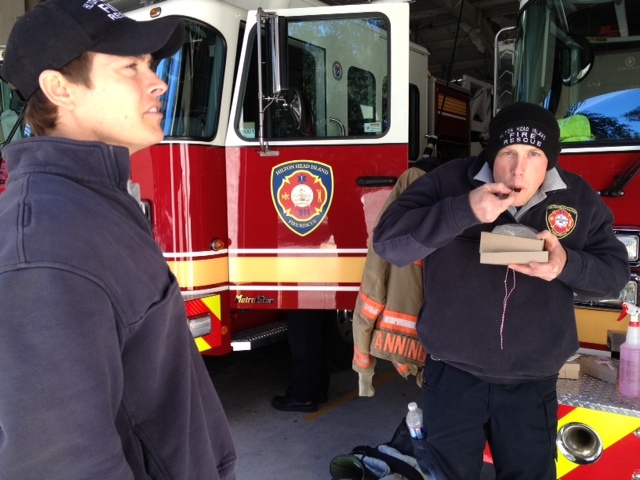 Great guys, and you can bet we’ll be dropping off more pie. As you can probably tell, we really enjoyed National Pie Day and the new friends we made. It was way too much fun to wait another year for, so we’ll be out on the road again soon, pie boxes at the ready. 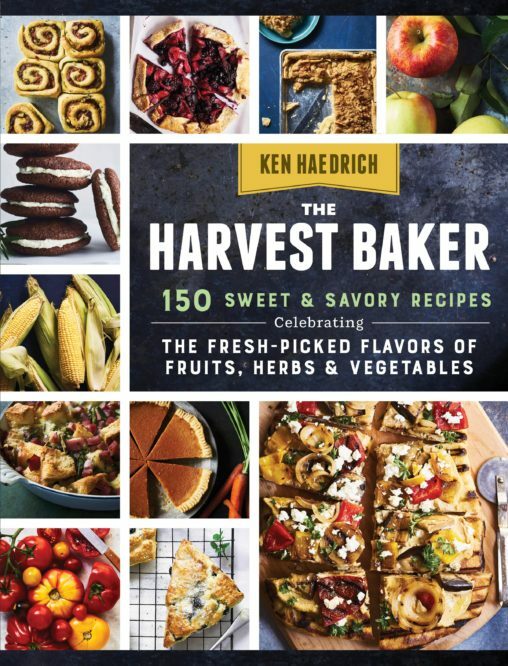 Because I’ve mentioned it a few times before, you probably know that The Old Farmer’s Almanac is the publisher of my most recent cookbook, Everyday Baking, as well as my upcoming cookbook all about comfort foods. While this activity keeps them busy, they still have time left to make longterm weather predictions for all parts of the country – predictions that are the stock-in-trade of their esteemed annual Almanac. This being Super Bowl weekend, all eyes have been upon their forecast for the New York area, where the game will be played outside at the MetLife Stadium, home to the Giants and Jets. Here’s the Almanac’s entertaining update of the Sunday forecast, starring my editor, Janice Stillman. If you haven't already, make and divide the Cornmeal Pie Dough as directed, according to the pans you'll be using. Refrigerate as directed. TO MAKE MAIN DISH POT PIES: When you're ready to line your pans, working with one (of four) piece of dough at a time, roll the dough into an approximate 7" to 8" circle on a sheet of lightly floured parchment or waxed paper. The exact size will depend on your pie pans. Line the pan with the dough, pinching the upper edge of the dough into an even ridge. Flute or crimp the dough as desired. Repeat for the other pans. Refrigerate. 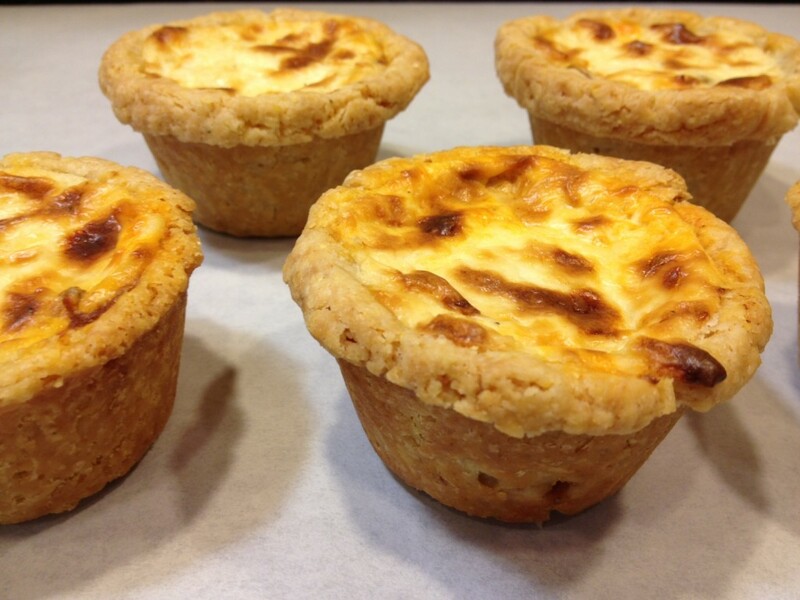 TO MAKE APPETIZER SIZE POT PIES: Lightly butter 8 standard size muffin cups and line each one with a 1/2" to 3/4" wide piece of wax paper, 8" long. This will leave you with tabs that will help you lift the pot pies out of the pan later. Place one piece of dough in a muffin cup. Using your fingers, press the dough evenly into the bottom and up the sides of the cup, pinching the dough so it comes about 1/4" above the top of the pan. Repeat for the remaining dough. Refrigerate. MAKE THE FILLING: Heat the olive oil in a large skillet. Add the onion and pepper. Saute over moderate heat for 5 minutes. Add the beef and pork and brown thoroughly, breaking it up with a wooden spoon as it cooks. Remove the meat from the heat, tilt the pan, then spoon off (and discard) all but about 3 tablespoons of the fat. Add the garlic, flour, and all of the spices to the meat. Put the skillet back on the heat and cook, stirring over moderate heat, for 1 minute. Stir in the salsa, water, brown sugar, pinto beans, and salt. 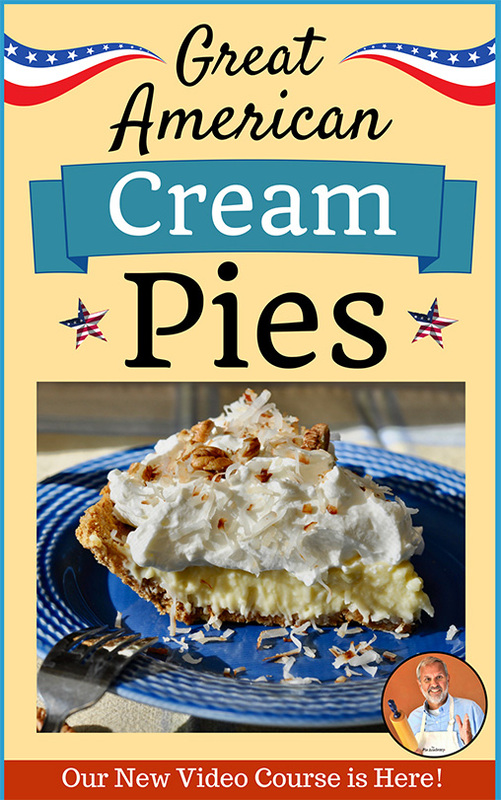 MAKE THE TOPPING: Using an electric mixer, blend the cream cheese in a mixing bowl until smooth. Blend in the ranch dressing until smooth. Blend in 1/4 cup of the milk; the mixture should have a consistency like thick heavy cream. Use a little more milk, if needed. Stir in the Cheddar cheese by hand. Set aside. When you're ready to bake, adjust your oven rack so it is one position above the lowest setting. Place a heavy duty cookie sheet or baking sheet on the shelf. Preheat the oven to 350°. If you're using a muffin pan, you probably won't need the baking sheet underneath. 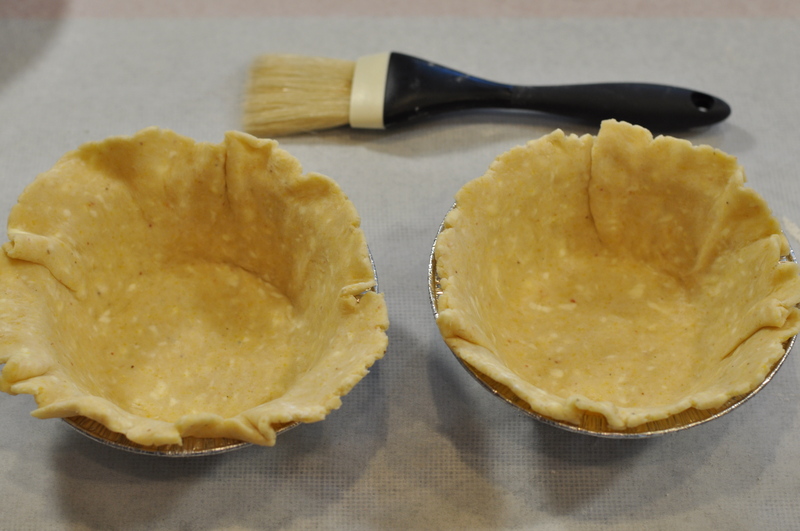 Divide the cooled filling between your pie shells, leaving about 1/2" (or slightly less) of space between the filling and the top edge of your shell. Smooth with a spoon. 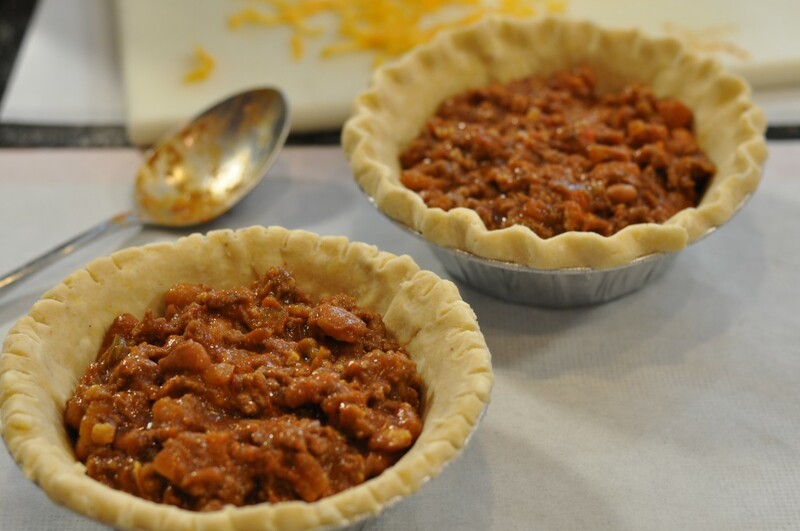 Divide the topping between the pies, spooning and spreading it evenly over the filling. Place the pot pies on the baking sheet, evenly spaced. Bake for 25 minutes, then adjust the shelf and bake in the center of the oven for another 10 to 15 minutes, until the topping and exposed crust are nicely browned. Transfer to a rack and cool for at least 20 minutes before serving. 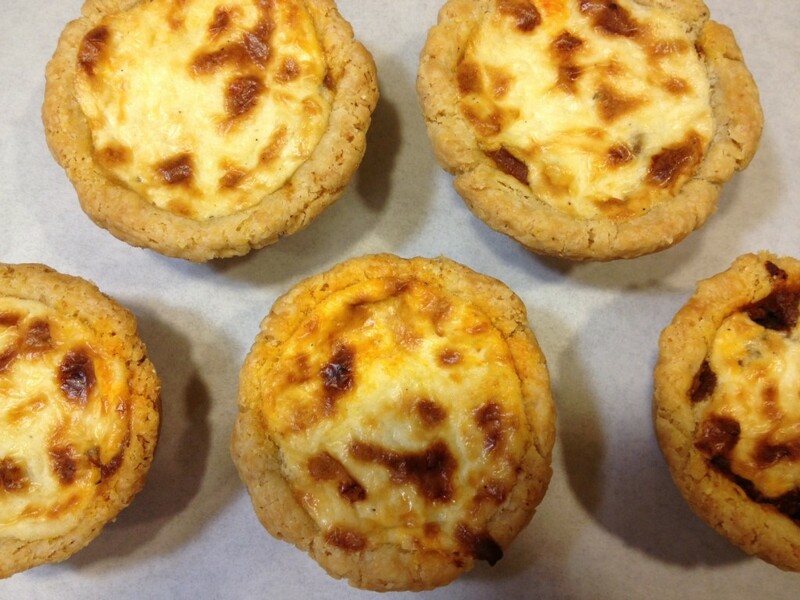 The muffin size pot pies will take about the same amount of time to bake, perhaps needing a few minutes less. Cool in the pan at least 20 minutes before trying to remove them from the cups. Makes 4 main dish or 8 appetizer servings. NOTE: It's important that you don't skip the key step of chilling your ingredients before making this dough. REMINDER: when I use the word PULSE, it always means a quick, 1/2- to 1-second burst of power. Nothing longer. TO MAKE THE DOUGH IN THE FOOD PROCESSOR: Combine the flour, cornmeal, and salt in a medium mixing bowl. Whisk to combine. Cover and refrigerate at least 1 hour or overnight. Put the butter pieces on a lightly floured plate and refrigerate. Move the plate to the freezer 10 to 15 minutes before mixing your dough. The Crisco can go right into the freezer on a floured plate as soon as it is cut. When you're ready to proceed, combine the cold water and vinegar in a 1 cup glass measure. Refrigerate until needed. Transfer the cold dry mixture to your food processor. Add half of the butter cubes. Give the machine 4 or 5 1-second bursts, then run the machine nonstop for 10 seconds. Remove the lid and add the remaining butter. Pulse 5 times. Remove the lid again and scatter the Crisco pieces on top. Pulse the machine 6 or 7 times; the fat should be in random, pea-size chunks. Remove the lid and sprinkle half of the water mixture on top. Pulse 3 times, to combine. Remove the lid, sprinkle on the rest of the water, then pulse again - 4 to 6 times - just until the mixture forms large, damp crumbs. It should not ball up around the blade. Turn these damp crumbs out onto your work surface. FOR A FULL SIZE PIE SHELL, pack the crumbs like a snowball. Flatten the dough with your palm, then gently roll the dough into a 1/2-inch thick disk. Wrap in plastic and refrigerate for at least 2 hours before rolling. TO MAKE 4 POT PIE OR SWEET PIE SHELLS, gather the crumbs but do not pack them tightly. Divide into 4 equal pieces. Shape them into balls, then flatten into 1/2-inch thick disks. Wrap and refrigerate for at least 1 hour before rolling. 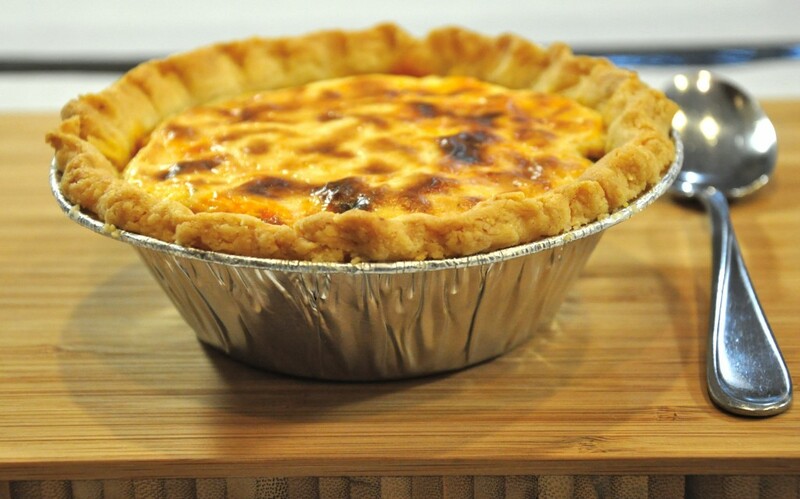 TO MAKE 8 MUFFIN-SIZE POT PIE SHELLS, gather the crumbs but do not pack them tightly. Divide into 7 or 8 equal-size balls, flatten into thick patties, and refrigerate for 15 minutes. Working with one piece at a time, press the dough evenly into the bottom and up the sides of 7 or 8 standard size muffin cups, sculpting the edge slightly above the top of the pan. Repeat for the remaining dough. Refrigerate the shells in the pan until needed. TO MAKE THIS DOUGH BY HAND: Increase the flour to 1 1/3 cups PLUS 2 tablespoons. Combine and refrigerate the dry ingredients as above. When you're ready to mix the dough, start with cold butter right from the fridge; if you freeze it, it will be too hard to work with. After you cut the butter into cubes, transfer your cold dry mixture to a large mixing bowl. Add half of your butter and toss to coat with flour. Using a pastry blender, cut in the butter until it is broken into very small pieces. Add rest of the butter, toss to coat, and cut it in briefly. Add the Crisco, toss gently to coat, then continue to cut until the visible fat pieces are no larger than the size of green peas. Sprinkle about half of the cold water/vinegar mixture over the flour mixture and mix briskly with a fork. Add the remaining liquid, 1 tablespoon at a time, mixing briefly after each addition. In part due to the cornmeal, you may need to add an additional 1 tablespoon cold water for the dough to come together nicely. Don't be concerned it if feels a tad moister than other doughs; the cornmeal will absorb the excess moisture. When the dough coheres, turn it out onto your work counter and proceed as above.